Seward Johnson, the internationally-acclaimed sculptor of realistic bronzes depicting everyday people, originally began his artistic pursuits as a painter. When his wife encouraged him to take a class in sculpture, his life and and art world would be forever changed. Having no formal training beyond a series of classes, Johnson entered an international sculpture contest in 1968, and won among 7,000 entries, kickstarting a sculpting career that has endured for nearly five decades. 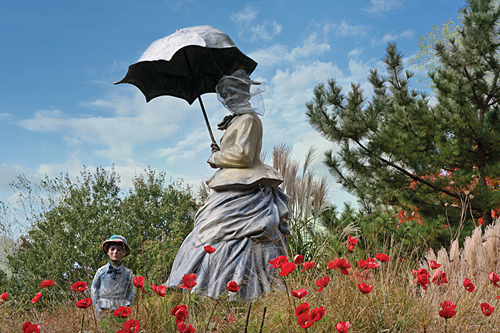 Seward Johnson, On Poppied Hill, 1999, cast bronze, aluminum, 1/8, 96 x 84 x 60 inches, Courtesy of The Sculpture Foundation, Inc., © 1999 The Sculpture Foundation, Inc.
"Propelled by that first competition, his passion and drive have encouraged numerous artists to pursue their dreams,” says Tom Moran, chief curator and artistic director at Grounds For Sculpture, a public sculpture garden and museum which Johnson later founded. “Many would have given up without his help. He is a doer who empowers others and takes them along with him on his wave of enthusiasm." As his love of bronze grew, Johnson started the Johnson Atelier Technical Institute of Sculpture in 1974 as a non-profit art casting and fabrication facility. Designed to encourage and instruct sculptors in artistic and technical aspects of their craft, it offered numerous services in casting, conservation, installation, enlarging, mold/pattern making and finishing with both paint and patina. In 1992, Johnson founded Grounds For Sculpture, a not-for-profit establishment in Hamilton Township, NJ, which was designed to display works completed at the Atelier and now welcomes approximately 160,000 visitors annually to view sculptures made all over the world by internationally recognized artists. The Sculpture Foundation's Johnson Atelier Division was moved right next to it in 2007. They oversee all projects from inception to completion and perform all the same services such as finishing, reassembling, painting and chasing for many artists. Only the casting is done elsewhere, still under their guidance. "There are 25 studio working artists, some who have been there as long as 30 years," says Moran. "They are able to learn new, modern methods and maintain a career in the arts. An example of this longevity is Jon Lash. He started out years ago in the shell molding room covered with ash and now sits in front of a digital computer doing 3-D scanning and milling." 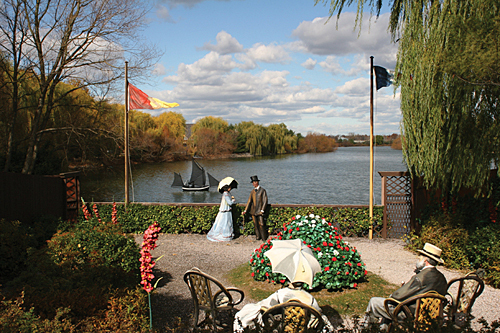 Grounds For Sculpture is currently featuring the most significant exhibition in its history, Seward Johnson: The Retrospective, on view through Sept. 21. There are more than 287 of Johnson's works, sited in three indoor galleries and across the 42-acre park campus. Forever Marilyn, recently in Palm Springs, CA, is one of the most popular features at the exhibition. The 25-foot sculpture depicts the iconic scene from Billy Wilder's The Seven Year Itch, when a blast of air raises Marilyn Monroe's white dress. Created in NJ in 2011, the sculpture has now returned home for display. If It Were Time, 1999, cast bronze, aluminum, 1/8; 72 x 456 x 420 inches, Courtesy of The Sculpture Foundation, Inc., © 1999 The Sculpture Foundation, Inc. Photo by David W. Steele. Johnson's works display a meticulous attention to detail. Each bronze begins with a 12-inch tall sketch in clay, then the scale is enlarged to life size. Delicate textures such as skin can be made more realistic by pushing fabrics into the clay at this stage. Sometimes articles of clothing are stiffened with resin and used in the mold process. There is no actual cloth on top of or under the bronze. Or, the artist may use wooden and metal tools with very fine points and edges to sculpt the clothing onto the figure. The figures are sawed into many parts for the casting process so there are dozen of roughly welded areas when the pieces are reassembled in bronze. At this stage, fine textures such as corduroy, tweed, patterned sweaters and others are replaced with use of an electric, drill-like tool. The process takes hours of intense labor and can take from one to two years to create one sculpture. A large staff of technicians perform the fabrications. Johnson uses color with a unique chemistry developed over years. Skin remains the traditional bronze patina. Current opaque colors utilize advanced treatment pigments like those used on airplanes. They are extremely resistant to climate conditions. Each sculpture is coated with a thin film of incrylac and a final coating of wax for added protection. His recent works focus on recreating well-known 19th century Impressionist and Post-Impressionist paintings that enable the observer to walk inside a 3-D environment. This is true of Dejeuner Deja Vu, a sculpture of Manet's Dejeuner Sur l'Herbe. Situated in a peaceful, grassy, tree-lined area, it reveals a private luncheon of males and females. One female bends over a small pond. Visitors can walk among the figures and even sit down to join them. Moran mentions, "It is so well camouflaged that it isn't noticed unless someone just happens to catch a glimpse. There is also a man-made lake across from the pond which a quarry was flooded to create." Seward Johnson: The Retrospective, spans many years of Johnson's exploration into what he refers to as "the visceral moment," which he describes as "the pivotal moment when viewers engage with a piece of artwork and transcend their own place in space and time to experience a heightened connection to their common humanity." Known for his detailed life size bronze sculptures depicting ordinary people in everyday activities, Johnson achieves a realism that is absolutely uncanny. He speaks with and studies subjects in the field he is depicting. He watches policemen and gardeners at work, businessmen reading newspapers, children eating ice cream, park benches with people on them. Details are so realistic that viewers want to actually touch the sculptures. Double Check, a bronze businessman looking into his briefcase on Wall Street at the time of the destruction of the World Trade Center led Johnson to create a makeshift memorial showing ashes, backdrop, flowers and helmets to honor the survivors, those lost, and first responders of 9/11. Both pieces are on display in separate galleries. Seward Johnson, Sailing the Seine, 1999, cast bronze, 2/8; 60 x 72 x 55 inches, Courtesy of The Sculpture Foundation, Inc., © 1999 The Sculpture Foundation, Inc. Photo by John Robson. Unconditional Surrender, shows the moment in American history when World War II ended, symbolized by the nurse and sailor embracing in celebration in Times Square. Castings of this piece are permanently located in Sarasota, Florida and San Diego, California. Another will be sited at the museum in Normandy, France in September. Photographs of Johnson's creations have been featured in numerous magazines. He appeared on the Tonight Show with several pieces. CNN has done some interesting stories on this prolific sculptor. His art can be viewed prominently all over the world in public areas as well as private collections and museums. During the exhibition, Grounds For Sculpture offers hands-on, art-making workshops inspired by the humor and humanistic insights of the artist. There are tours of the park artwork, screenings of archival footage and exclusive behind-the-scenes tours with Johnson himself. Johnson enjoys walking around the grounds and, when he sees a visitor examining a sculpture, he'll often make a derogatory critique in order to solicit the viewer's thoughts on the piece. He loves when the person defends his artwork.